U.S. disburses $3.4 billion to fight HIV/AIDS in Nigeria. The U.S. Consulate General in Lagos, on Tuesday said that the U.S. Government had disbursed over $3.4 billion to support the Nigerian HIV/AIDS response. The Consul-General, John Bray, made the disclosure at an event organised by the Public Affairs and Medical Sections of the Consulate to mark the 2016 World AIDS Day in Lagos. According to him, this disbursement has been since the inception of its President’s Emergency Plan For AIDS Relief (PEPFAR) in 2004. Mr. Bray said that PEPFAR was a U.S. Governmental initiative to address the global HIV/AIDS epidemic and help to save the lives of those suffering from the disease, primarily in Africa. He said that before PEPFAR, HIV infection was a death sentence in Nigeria and in Africa in general with entire villages being wiped out in some places. According to him, at that time, less than 5,000 Nigerians supported solely by the Nigerian government were on treatment. “The U.S. and Nigeria enjoy a strong relationship based on our many shared interests. “In the case of HIV/AIDS both countries have pledged to work to eradicate HIV/AIDs and are committed to providing high quality, life-extending care, free from stigma and discrimination. “Some measures of success show that 600,000 men, women and children which are about 90 percent of the people living with HIV/AIDs are currently on HIV treatment. “About 8.7 million people have received HIV counselling and testing; more than 55,000 pregnant women have been provided anti-retroviral drugs for the prevention of mother-to-child transmission of HIV. “Also, 750,000 adults and children living with HIV/AIDs have received care to support quality of life and 700,000 children orphaned by AIDS have received care and support,’’ he said. 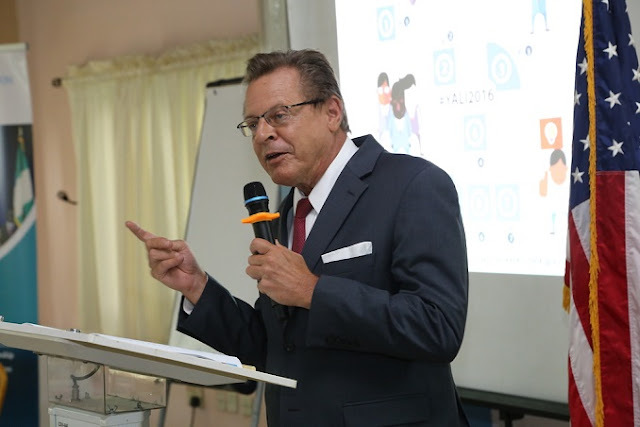 Mr. Bray said through the contributions of the U.S. and Nigerian governments, the United Nations family, Global Fund, private sector, faith-based community, civil society and other partners, AIDS epidemic could be eliminated by 2030. Bisola Olumegbon, Head, Medical Unit of the Consulate, said that the HIV/AIDS epidemic was considered a threat to the peace and security of the nation. She said there was need to promote awareness, education, counselling, care and support to defeat the scourge. Oladipupo Fisher, Director, Lagos State AIDS Control Agency (LSACA), appreciated the U.S. Government for their partnership and support in ensuring the eradication of HIV/AIDS by 2030. Fisher said collaborative efforts were required to achieve the vision. Also, Emmanuel Olaoti of the Society For Family Health, identified low use of condoms, poverty, multiple sexual partners, stigma and discrimination as factors contributing to the burden of the disease in the country. He urged Nigerians to go for regular counselling and testing to know their status and prevent the disease. In his remarks, Mr Ibrahim Umoru, an AIDS activist in the Treatment Action Movement, said it was cheaper and smart to remain negative than to be HIV positive.